"We invite you, brave adventurers, to explore lands uncharted and locked away, cut off from Stormwind and Orgrimmar, from your friends and families. Will you conquer the Doldrums or will you become another lost soul?" Unknown Shores is a World of Warcraft roleplay server, built over Legion 7.1.5, with a plethora of custom crafted game mechanics centered on giving you, the player, the tools to bring the change you want in the world of the Doldrums! Grom’Thar. A player guild base with a mix of world-editing and player-spawned objects through the architect profession. For anyone unfamiliar, private servers benefit from the ability to create anything that you can imagine, we have taken this a step further than most servers and given our players unprecedented abilities to interact with and roleplay within the Warcraft setting. Using a tool we call the DMkit we can create custom encounters in the world which can be anything from ambushes to puzzles. Our professions are tied into a custom built RPG which replaces the World of Warcraft combat mechanics and professions. This means turn-based combat where you can truly build your character in a manner similar to tabletop RPGs like Dungeons and Dragons or Pathfinder. This extends to player professions, which are split between gathering and crafting.The former allows you to gather fish, meat, leather, timber, scrap metal, stone and more whilst the latter can help you make food, armour, weapons, enchantments, bandages and beer or building your own base. One of our professions is the ‘architecture’ which allows players to craft and place in-game objects. This can be anything from the construction of fortifications to simply adding a bit of clutter to a personal dwelling. This particular profession is an incredible tool that gives players the ability to directly edit and modify the world in building camps, forts or whatever they fancy, though be wary not to build your home-from-home somewhere hostile! Fort Drustgarde / Port Sabella / Egtown / Flotsam / The Port of a Thousand Names. A 100% player-made settlement using the architect profession. 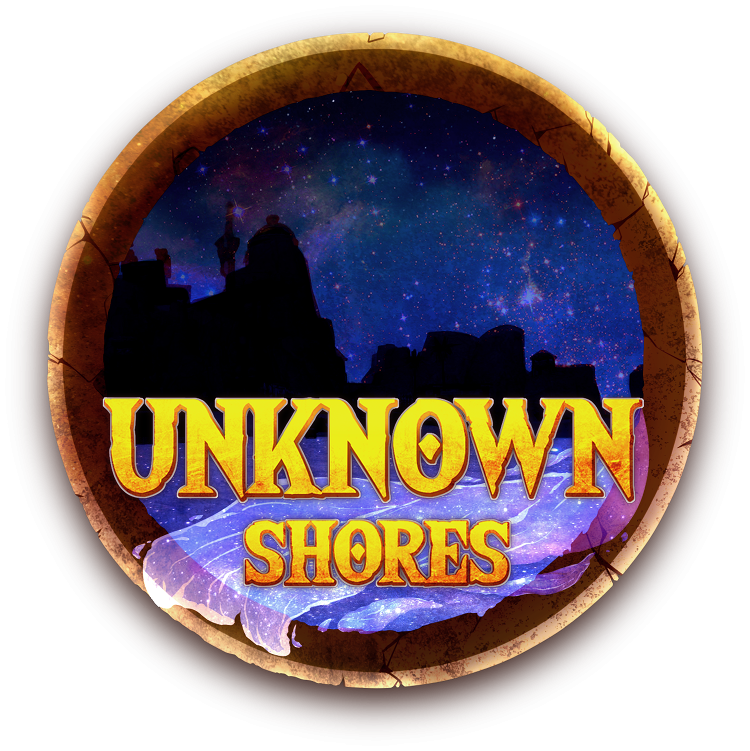 Unknown Shores takes place on a set of islands in an area known as the Doldrums, a strange place which is largely unknown in the wider world of Azeroth. Similar to the Bermuda triangle, it is a place which draws in those unfortunate enough to come to close and through mystical means prevents those trapped there from leaving. Using the map making tool noggit, our editors have built a set of islands for you to explore and exploit, with more islands in the works featuring new secrets, encounters and biomes previously not seen on the Unknown Shores. Whilst indeed many of the characters and locations will seem unfamiliar, organisations and banners will crop up on occasion, be it the golden anchor of Kul’Tiras upon the isle of Sotoras or the Zandalari of Bluegill Arch. Unknown Shores has a dedicated staff team focused on various aspects of managing a roleplay server with our focus being on creating a friendly environment that reacts to your character's actions. Actions have consequences! Beyond the tools described above, we offer anyone who wishes to the ability to become a Dungeon Master with the powers and support of the staff team to create their own storylines within our setting. Do you want to take the adventurers on a expedition into the jungles of Opej, or perhaps craft a dungeon for them to discover? Anything is possible and we’ll be here to help you in every way we can.